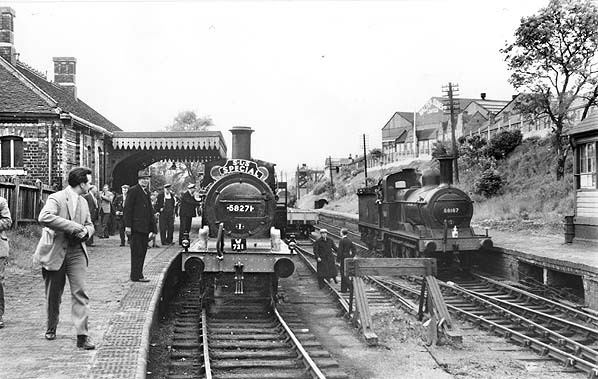 Notes: The West Midlands Railway (WMR) was formed on 14 June 1860 by the union of the Oxford, Worcester & Wolverhampton Railway (OW&WR) the Newport, Abergavenny & Hereford Railway (NA&HR) and the Worcester & Hereford Railway (W&HR). The WMR was authorised to build a short branch from Old Hill, on the Great Western Railway (GWR) Snow Hill to Stourbridge Junction line, to Halesowen. This short branch was to make an end-on connection with the proposed Halesowen & Bromsgrove Branch Railway (HB&BR) thus creating a through route to Bromsgrove and Longbridge on the Midland Railways (MR) Birmingham to Gloucester route. Before construction could begin the WMR was absorbed by the GWR on 1 August 1863 and it would be the GWR who would oversee the building of the line. The contract to build the line was awarded to Henry Lovatt and the branch opened on 1 March 1878. 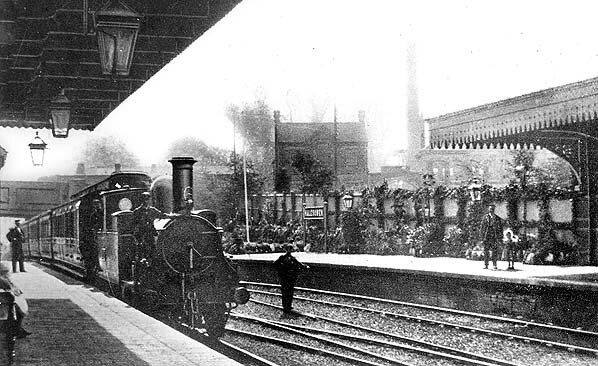 The station opened on 1 March 1878 and consisted of a single platform on which the GWR’s station building stood. It was a single-storey structure with a hipped roof. The red brick of which it was constructed was relieved by lighter string courses and the windows had segmental arches. The platform was sheltered by a flat awning with a serrated valance, supported by wide ornamental brackets, and it extended along about half the length of the building. 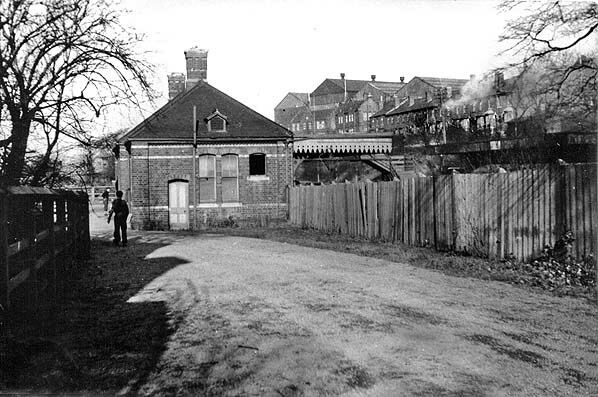 A goods shed and cattle pens were provided to the north of the station along with associated sidings. In anticipation of the completion of the line from the south, a further platform was added in the early 1880s. On this platform was a substantial waiting room which boasted a bracket-supported awning to complement that on the main building, and there was also a GWR pattern platform-mounted signal box controlling movements within the station. Both platforms were linked by a footbridge which had stringers and landing supports made from old rails and was clad in wood. At this time the track layout was altered with the original platform becoming the up (to Old Hill) and the 1880s additional platform became the down (to Longbridge). The down platform was not directly accessible for through running and any service wishing to stop there had to reverse. It is entirely possible that the GWR saw this as a way of preventing the MR from running through from Old Hill. During 1904 the layout was modified to allow through running via the down platform and the addition of a central siding/run-round loop for MR trains terminating from the south. Photographs do show the two terminating services both using the down platform. In 1905 the Austin Motor Company opened a new car plant at Longbridge. By 1913 the workforce had grown to around 2,300 employees and by the end of the First World War it had swelled to 22,000. In 1915 the first sidings were laid at the plant and the MR and GWR obviously saw the increasing workforce as a chance to increase passenger revenue along the branch. A new station was constructed in the MR style. Even with the increase in use the general passenger numbers never reached acceptable levels, and in April 1919 the MR withdrew the passenger service between Halesowen and Kings Norton. It was the GWR who introduced a daily workmen’s service each way between Old Hill and Longbridge which called at Halesowen. Bradshaw of December 1895 shows there to be 15 services from Old Hill to Halesowen Monday to Saturday with 13 return services and five up and five down services on the GWR & MR joint line. Passenger receipts on the southern section of the branch never lived up to expectations and in April 1919 they were withdrawn. Bradshaw of July 1922 shows a marked improvement in service on the section from Old Hill to Halesowen following the introduction of rail-motors in 1905 with 24 each way from 5.50am through to 9.53pm on Monday-to-Friday and 5.50am to 10.35pm on Saturday in the down direction from Old Hill to Halesowen. Services in the up direction started at 6.07am through to 10.00pm on Monday-to-Friday and 6.07am to 11.05pm on Saturday. Despite this intensive service the competition posed by local omnibus companies forced the GWR to withdraw passenger services on 5 December 1927. The station remained open for goods, workmen’s trains and excursion traffic, and the line was still busy with the passage of freight to and from the Halesowen Canal Basin and several other sources along the line. Unadvertised workmen’s trains to and from the Austin motor car factory at Longbridge through to Old Hill were operated by the GWR from 1917. When the railways were nationalised on 1 January 1948 the Halesowen Railway was allocated to British Railways (BR) Western Region, but in a boundary adjustment on 1 February 1958 it was transferred to London Midland Region administration. Private motor vehicle ownership rapidly expanded during the 1950s, and with demand for its train services declining BR announced that the workmen’s trains would be discontinued on 29 August 1958. Representations from Birmingham City Council over the issue of the withdrawal had a limited effect, with the Birmingham New Street to Longbridge being retained temporarily. So, on 29 August 1958, the final Longbridge to Old Hill service departed with the service bring formally withdrawn from 1 September, with the Birmingham New Street services finally ending on 2 January 1960. The council placated inconvenienced passengers with the assurance that the ‘improvements in bus services adequate to cover the workers’ needs’. By the mid 1950s the station infrastructure was in a terminal decline and pictures of the station show it in a shocking state. 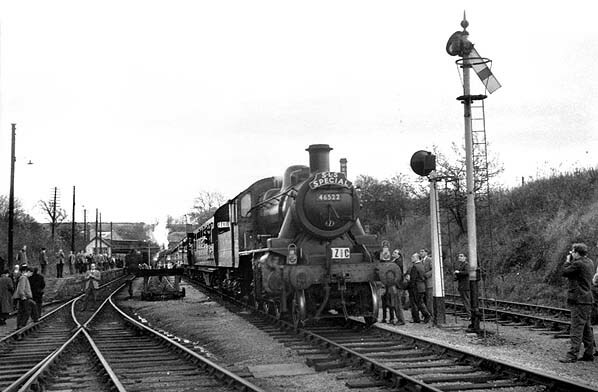 The final freight service on the Halesowen to Rubery section ran on 4 January 1964 and the line was closed from 6 January. 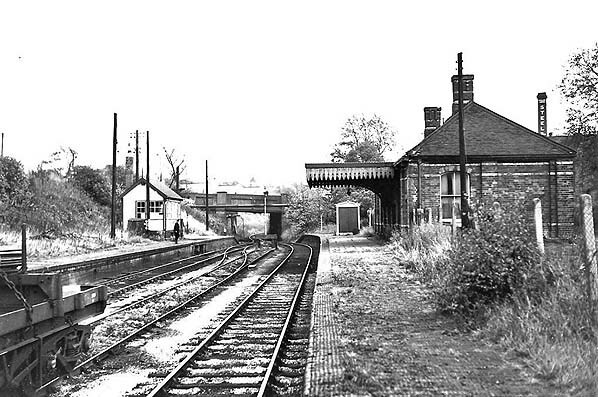 Freight continued to work along the northern end of the line until the section from Old Hill to Halesowen was officially closed on 9 September 1968 although, in practice, trains did run to Walter Somers foundry, located near the stations goods shed, until October 1969. 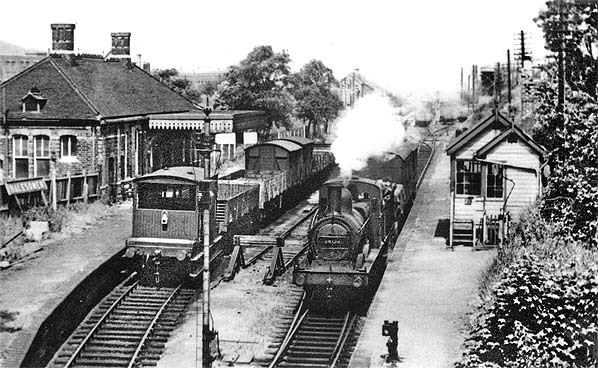 An early 20th Century picture posed for the photographer looking towards Hunnington with a tank engine standing in the platform with a passenger service from Kings Norton via Longbridge. 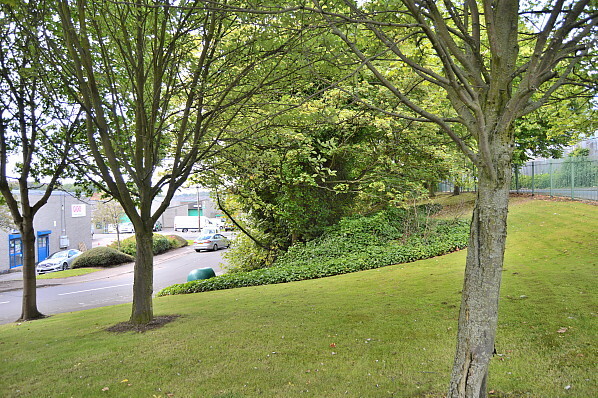 The station looks to have a well kept garden on the opposite platform. station with its two platforms. By the 1903 1:2500 scale map the rural area shown around the station in the preious map has been replaced with industrial developments springing up around the station, most notably the Gunbarrel Works to the north east. The 1954 town plan clearly shows the entrance ramps from, what is now called, Mucklow Hill formerly known as Whitehall Road. Looking from the Whitehall Road overbridge with a Great Western Railway steam railmotor standing in the Longbridge bound platform with a compliment of staff in attendance. It was usual practice at the station for the railmotor to wait further up this platform and for the branch train via Hunnington to terminate in the same platform thus avoiding the passengers having to cross the station footbridge. Looking south from the northern end of the station and the unusual track layout is evident. 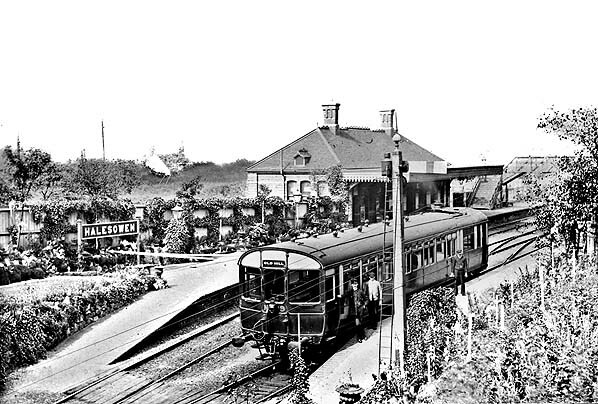 The line that the photographer is standing in was the original through line from the Halesowen Railway not originally connected to the down platform, right but in 1904 the layout was changed with the down platform being directly connected to the line from Longbridge. 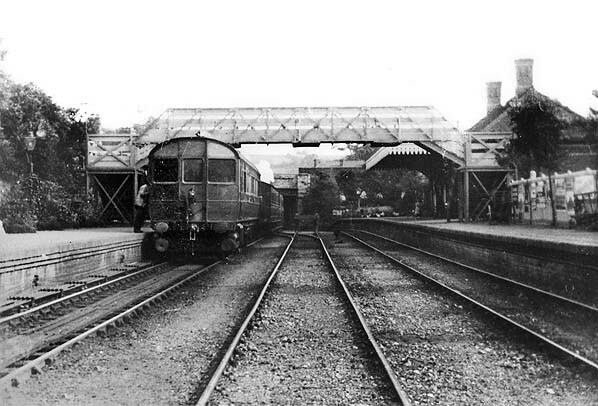 Looking from Whitehall Road towards the station building on the down platform around 1949, by this point the passenger service had ended some 20 years previously. The Walter Somers foundry can be seen dominationg the skyline behind the station. Looking south during October 1956 from the same view point as the previous picture following the withdrawl of the passenger service. The main platform building has been retained but the substantial building on the up platform has been demolished and the footbridge is partially dismantled. 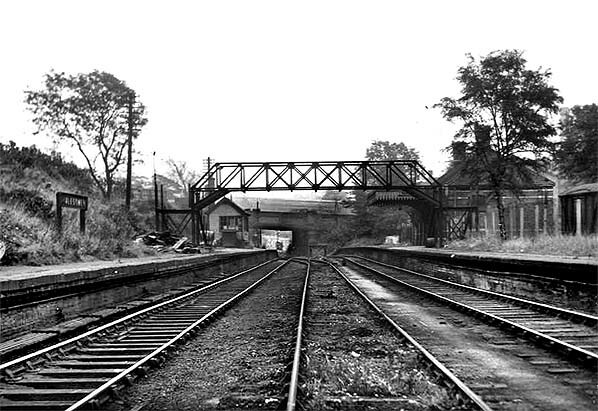 Looking south from the down platform in the late 1950's since the previous shot the footbridge has been removed. Looking north from the Whitehall Road overbridge at a busy scene in 1959 a Johnson 1142 class 0-6-0 seems to be engaged in some shunting manouvers. This class of locomotive were introduced from 1875 onwards and would be completely extinct within 2 years. The final tour to visit this line before closure was another SLS special this time called the Last train on the Harbourne branch and Farewell to the Halesowen branch. Seen here on 2 November 1963 looking south the train stands in the down platform with passengers taking the opportunity to stretch theirs legs and record the scene. The tour was top and tailed with Ivatt 2MT class 2-6-0 46522 leading up to Old Hill with 46421 on the rear to take the train back along the branch. 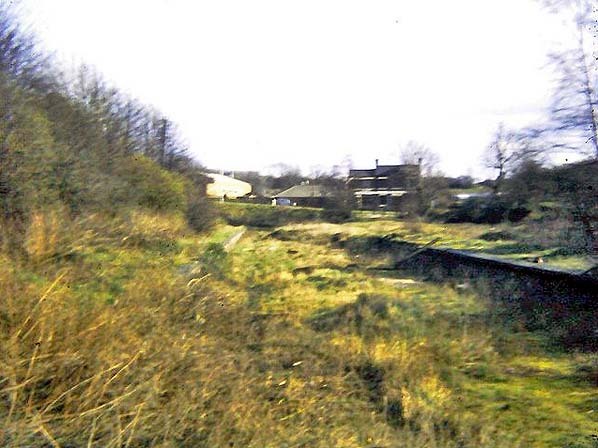 A July 1977 view of the station site looking north towards Old Hill the down platform is to the left and all traces of the buildings have disappeared. Another view of the station site in July 1977 now looking south the overbridge at the southern end of the station has been demolished and the whole station site is begining to become infested with weeds. 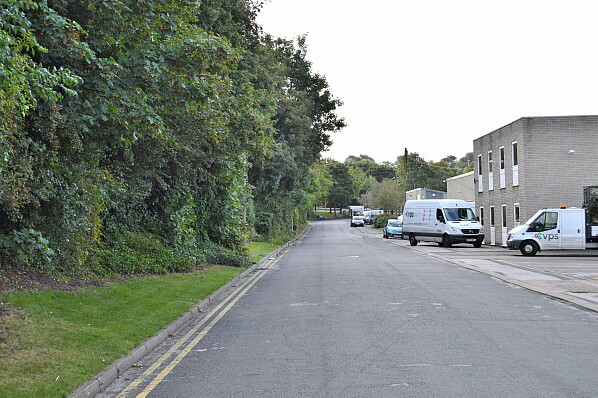 Looking south from the approximate site of the station any trace of a railway ever existing here has been swept away with the industrial estate development. 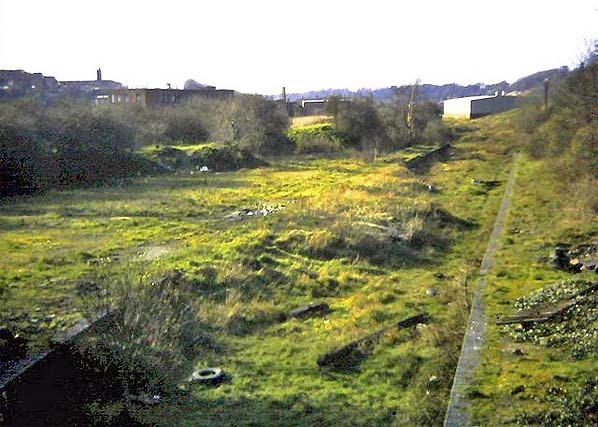 The station site looking north from what was Whitehall Road and is now Mucklow Hill.